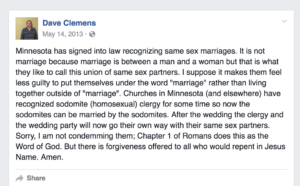 David Clemens forgot to wipe his public Facebook profile clean before running for North Dakota State Senate. This is the same David Clemens who wants to restrict voting because North Dakota is becoming “more diverse.” He also once received an illegal loan from a Christian non-profit so he could buy a truck. The next state legislature will likely be voting on a bill that, if passed, would protect people from discrimination based on their sexual orientation. The same bill came up last year, but was killed by the Republican majority. 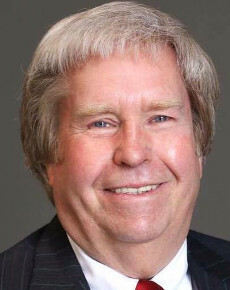 Clemens is running against the Democratic incumbent Tyler Axness. We reached out to Clemens, Axness and the state Republican and Democratic parties and will update if we hear back. 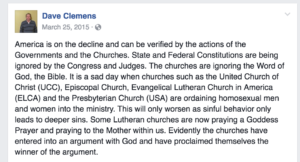 Be the first to comment on "ND Legislative Candidate Upset Because “Sodomites Can Be Married”"